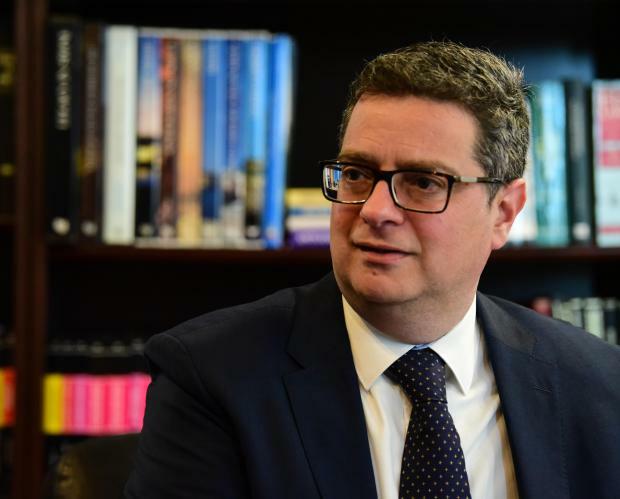 A year after the FIAU flagged a “reasonable suspicion of money laundering” by Opposition leader Adrian Delia, the police investigation has hit a brick wall. The Sunday Times of Malta can confirm that a report by the Financial Intelligence Analysis Unit drafted in March 2018, concluded that sufficient information was available to conclude that Dr Delia and his bank account in Jersey “may have been used for money laundering” (see details below). However, senior police sources explained that although the intelligence report handed to them this time last year had recommended a criminal probe, this had been left on the back burner for several months as the case was deemed too difficult to crack and not as pressing as other matters. “We do not have great hope for this investigation. We opened inquiries into the report’s findings. However at this point it depends largely on other jurisdictions – some of which are very secretive – handing over the necessary information, as well as probing a 15-year-old prostitution racket which allegedly operated in another country,” the source said. Four months ago The Sunday Times of Malta reported how a London-based prostitution racket and the alleged involvement of Dr Delia were part of an ongoing money-laundering investigation by the police. The allegations against Dr Delia, which date back to the period between 2001 and 2004, had first been reported by the late Daphne Caruana Galizia, about two months before she was killed in a car bomb explosion outside her Bidnija home. Dr Delia has vehemently denied any wrongdoing and insists his involvement was limited to that of a legal advisor and representative for other Maltese nationals involved. The Sunday Times of Malta has now learnt that the 30-page FIAU report details how the FIAU had received corroborating information around the time Ms Caruana Galizia’s had first exposed the matter on her website Running Commentary back in 2017. A tip-off received by the FIAU in 2017 indicated that a Barclays account in Jersey owned by Dr Delia could have been associated with a Soho prostitution racket and used to launder illicit gains. The Sunday Times of Malta can confirm that the FIAU then conducted an in-depth analysis of Dr Delia’s offshore Jersey account, gathering information from several jurisdictions, including Malta, the UK, Switzerland, the Bahamas, the British Virgin Islands and the Marshall Islands. In a nutshell, the unit found that Dr Delia’s account – which he has repeatedly denied having any recollection of – was opened in February 2001 and closed in October 2004. While it was open, some £346,000 (around half a million euros) were deposited into the Jersey account in the form of varying cash and cheques which were made directly through branches around London, predominantly the Edgware Road branch, but also via a number of other locations. It was this activity, together with Ms Caruana Galizia’s reporting, which prompted the FIAU to look a little deeper. It remains unclear exactly what happened between the years 2001 and 2004. However, FIAU investigators believe two Maltese nationals, Emanuel and Eve Bajada, were involved in a dispute over money that was supposedly deposited in Dr Delia’s Barclays Jersey account for the benefit of two mysterious companies – Healey Properties Ltd and AAS Freight Services Ltd – believed to be owned by their relatives, Eucharist and Mary Bajada. Emanuel and his son Victor Bajada were in 2005 accused of human trafficking and running a brothel in Malta. Emanuel pleaded guilty and his sentence was later confirmed by the Criminal Court of Appeal in September 2016. He was also separately charged with money laundering on the same case and found guilty. Ms Caruana Galizia’s allegations that Emanuel and Eve Bajada deposited funds into Dr Delia’s Barclays account in Jersey were confirmed through account statements made available to the FIAU investigators. The amounts deposited, however, were not £20,000 per month as had been reported by Ms Caruana Galizia but mostly varied from £400 to £16,000 per deposit (an average of £13,000 per deposit). It was this revelation – that the deposits into Dr Delia’s account were not fixed monthly rates and were therefore not believed to have been rent payments – which is considered one of the main revelations of the FIAU probe. The average amount deposited was also believed to be too high to be a rent payment in the early 2000s. Most of the money deposited into Dr Delia’s Jersey account was in cash or cheques and came from branches around the Soho area – which is known to be linked to prostitution and brothels. Dr Delia’s Jersey account and Healey Properties Ltd’s bank accounts with Bank of Valletta shared the same Birkirkara address. 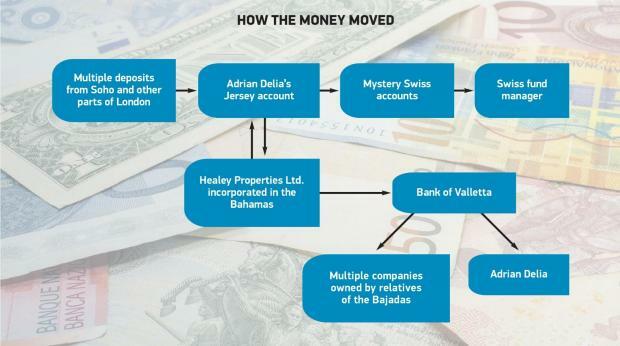 All the transactions in and out of the account appeared to be linked with the Bajadas and the properties supposedly owned by Healey Properties and AAS Freight Services Ltd.
Money from Dr Delia’s Jersey account was sent to two mystery Swiss bank accounts. Around £158,000 was transferred to one Swiss Barclays account across eight payments, however it was unclear who owned this account and why the money was moved there. The investigators found that another £60,000 was transferred to a separate Swiss Barclays account in two payments. Intelligence gathered by investigators suggests that this money was then moved on to a certain Roxanne Arlettaz, believed to be a Swiss fund manager. However at that stage the trail goes cold and it remains unclear where this money moved next. Investigators meanwhile found that other funds from Dr Delia’s Jersey account were also transferred to Bank of Valletta accounts held by Healey Properties Ltd. The company held eight BOV accounts and investigators do not exclude that it also held other bank accounts in more secretive jurisdictions. The funds from Dr Delia’s Jersey account were then transferred from Healey Properties Ltd’s Sterling account held with BOV to the company’s Maltese Lira accounts at the same bank. A number of cheques totalling Lm106,200 (roughly a quarter of a million euro) were then issued in favour of beneficiaries who are related to Eucharist Bajada (senior), Eucharist Bajada (junior) known as Kris, and Dr Delia. Although the FIAU concluded that Dr Delia and his bank account in Jersey may have been used for money laundering, it pointed out that due to the sensitivity of the case it had limited its requests for information. This, sources informed The Sunday Times of Malta, was because of the risk of politicians being alerted to their inquiries. Dr Delia has consistently denied any allegation of wrongdoing, and on Saturday called a press conference in which he said that a number of documents related to financial transactions with his signature on them had been forged. The PN leader said he had been made aware of the alleged forgeries after receiving questions about the FIAU investigation from The Sunday Times of Malta. The Soho matter had been raised by the PN’s ethics committee, which had been given 48 hours to probe the allegations, during the party’s 2017 leadership race. In its conclusions, the committee noted that Dr Delia had not given an explanation on certain “unverified and pending issues” related to the Jersey account, particularly its use, scope and the legality of the source of the funds. For this reason, the PN administrative council had called on Dr Delia to consider withdrawing from the contest. Since then, Dr Delia has gone on record to insist he knew nothing about the bank account in Jersey. He had said he did not remember ever having a Barclays account in Jersey he said he was not able to exclude this possibility entirely. At the time Ms Caruana Galizia had published a document supposedly proving the existence of his jersey account, Dr Delia had phoned Barclays International’s call centre late at night to enquire about the matter. According to a recording of this call, which had been made available to The Sunday Times of Malta, no record of such an account was found. The Sunday Times of Malta is informed that the people investigated were Adrian Delia, Eucharist Bajada, Eucharist Jr. Bajada, Mary Bajada, Emmanuel Bajada, and Eve Patricia Bajada. Healey Properties Ltd, incorporated in the Bahamas back in 1999, was also indicated in the investigation. According to the company’s BOV accounts, Healey Ltd was registered at Aladan, Triq Karm Zerafa, and Birkirkara. It is believed to be owned by Eucharist and Mary Bajada. Another company owned by the two Bajadas, AAS Freight Services Ltd, incorporated in Marshall Islands, was also a part of the investigation. £60,000 to another Swiss Barclays Bank account across two payments. The two accounts were held by Eucharist Bajada and Mary Bajada and date back to the 1990s. While one of these was mostly dormant and is now closed, the other is still open today with a balance of more than £460,000.